Portugal, with its welcoming locals and pleasant climate, offers expats a very good quality of life. However, career prospects and job security continue to rank poorly. Portugal attracts an above-average percentage of retirees. It also ranks in the top 10 for family life. Expats enjoy the climate and weather. Around eight out of ten feel at home there. A large majority rate the cost of living positively. Portugal ranks an impressive 6th out of 68 countries in the overall results for 2018. In three indices, the country ranks in the top 10, including fifth for ease of settling in and second for quality of life. With Portugal’s positive ranking for quality of life, it is perhaps no surprise that almost eight out of ten expats (79%) are generally satisfied with local socializing and leisure activities. Nearly all respondents (94%) state they are happy with the climate and weather, with 84% saying they considered this factor a potential benefit even before moving to the country. Such results are perhaps to be expected, given Portugal’s mild winters and sunny summer climate. Portugal is safe and secure. The people are fantastic and have helped us in all aspects unreservedly. In addition to this, 85% of expats think that the quality of medical care in Portugal is generally good, which is 18 percentage points above the global average (67%). In fact, over three-quarters (77%) also consider healthcare to be affordable. The country’s high quality of life seems to be an important factor for people choosing to move to Portugal: 75% of respondents say that they considered the general living standards a potential benefit before moving there. 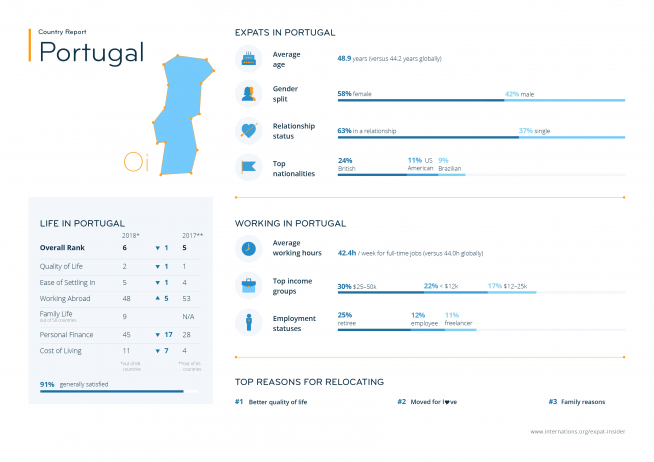 Expats in Portugal also find it easy to settle in: over eight in ten (82%) feel largely at home in the local culture compared to a global average of six in ten. 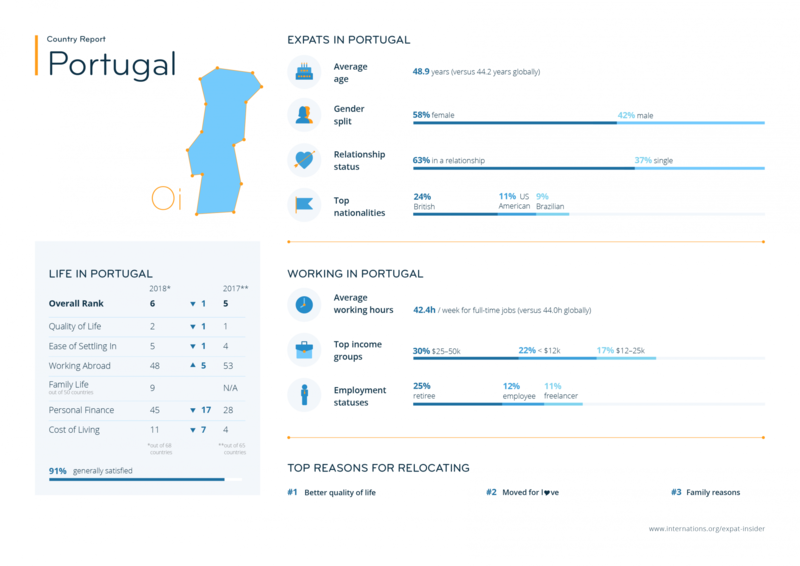 Not only do 83% say that it is generally straightforward to settle down in Portugal (compared to the worldwide average of 59%), but 85% also face few or no challenges getting used to the local culture. These positive results are perhaps unsurprising, considering that nine in ten feel that the local population is by and large welcoming and that attitudes towards foreign residents are friendly (87% vs. a worldwide average of 66%). Just under two-thirds (64%) say they have little trouble making local friends, with the majority of respondents (78%) saying that they have either a fairly mixed group of local and expat friends or that they socialize mainly with local residents. Even if you do not speak the local language, it is still generally easy to live in Portugal, with 65% agreeing that a lack of Portuguese language skills does not make it difficult to live there. Although Portugal ranks well in terms of quality of life and settling in, the country performs poorly in terms of working abroad, coming in 61st place out of 68 countries for career prospects and satisfaction. Just under two in five (39%) are satisfied with their career prospects compared to the global average of 55%. Portugal also ranks a disappointing 53rd out of 68 countries for job security. However, close to three in five (59%) are satisfied with their job in general, and even more (72%) rate their work-life balance positively. Interestingly, one quarter of respondents in Portugal are retirees, which would explain why the average age of expats in Portugal (48.9 years) is higher than the survey average (44.2 years). 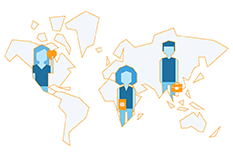 It seems that Portugal is also particularly popular with freelancers — at 11%, their share is disproportionately high compared to the global average of 5%. When it comes to personal finances, 62% of expats in Portugal are generally satisfied with their financial situation. Just over three-quarters (77%) say their disposable household income is enough or more than enough to cover their living expenses, about the same as the global average (78%). However, compared to the survey average of 51%, a majority of respondents in Portugal (82%) consider the cost of living to be generally affordable, and just over seven in ten (71%) perceived the cost of living as a benefit before moving abroad, compared to the worldwide average of just over four in ten (42%). With Portugal ranking 9th out of 50 destinations in the Family Life Index, respondents raising children abroad are largely content with family life in Portugal. An impressive 94% are generally satisfied with their personal family life compared to the global average of 79%. A total of 66% of expat parents also state that childcare options are numerous and easily available, while 64% say they do not struggle to afford childcare. When it comes to educational standards, over four in five parents (81%) say that the quality of education in Portugal is generally high. It's a great place to raise a family and have a high level of quality of life. It seems Portugal is the place to be for families, ranking an impressive 11th out of 50 countries for family well-being. Among expat parents, a significant majority of 96% agree that attitudes towards families are friendly overall. Almost all the expat parents (97%) say that children’s safety is good, with another 96% rating their children’s well-being positively. In addition to this, 78% of respondents consider the leisure activities for children to be satisfying. 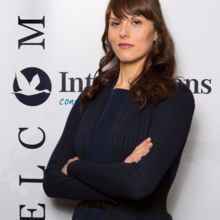 One British expat says, “it's a great place to raise a family and have a high level of quality of life”.